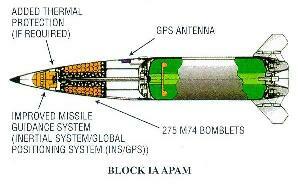 Army TACMS Block IA is an extended range variant of the Army TACMS Block I missile. The Block IA effort entails integrating an onboard Global Positioning System (GPS) with antenna and software into an inertial navigation system and reducing the Block I payload from 950 M-74 bomblets to approximately 300 M-74 bomblets to achieve the required accuracy and extended range. To compensate for the reduced payload, the accuracy of the missile has been improved with inflight GPS updates. If GPS is rendered inoperable, the Army TACMS Block IA reverts to inertial guidance only and maintains Block I accuracy. The missile is fired from the Improved Position Determining System of the M270 "deep strike" launcher and the M270A1 launcher with the improved fire control system (IFCS) and improved launcher mechanical system(ILMS). Army TACMS Block IA is a semi-ballistic missile that provides near all weather, day and night, precision strike capability at ranges beyond existing cannons, rockets, and missiles. Block IA uses the guided missile control and propulsion systems of the Army TACMS Block I missile. 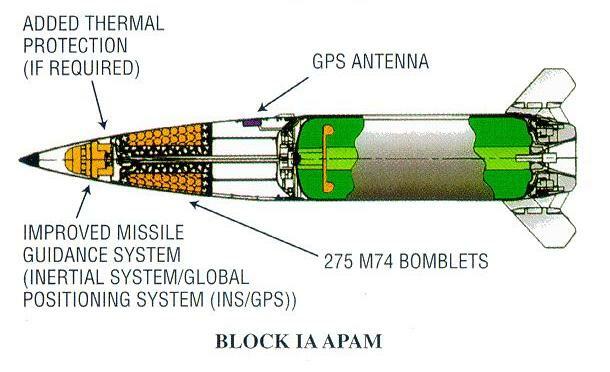 The Block IA warhead will use a majority of the Block I warhead components except the payload of anti-personnel/anti-materiel (APAM) M-74 bomblets will be reduced in the Block IA to extend its range. Block IA uses an improved version of the Army TACMS Block I Missile Guidance Set (IMGS) to achieve the improved accuracy needed to meet the Block IA system requirements for mission accuracy. The IMGS uses an embedded GPS receiver (EGR) to receive and process GPS satellite navigation signals and integrate the GPS data into the inertial guidance scheme to improve navigational accuracy. There is 1 missile per guided missile and launching assembly and 2 missiles per launcher load. Prior to completion of the MLRS Improved Fire Control System (IFCS), the M270 launcher requires modifications that include the installation of an interim improved positioning and determining system (IPDS) and an interface for connecting a KYK-13 cryptographic loading device. The IPDS, the positioning and navigation unit of the future IFCS, employs ring laser gyros, force-rebalanced accelerometers, and the GPS to provide launcher location and navigation data. The Army will field one battalion of IPDS-equipped launchers until IFCS is fielded in the M270A1 launcher program. In April 1996, the PEO Tactical Missiles conducted a Low-Rate Initial Production (LRIP) review of the program and authorized procurement of 70 Block IA missiles. The Army conducted three missile launches prior to the LRIP review, and five additional missile firings in the formal developmental testing between February and October 1996. The IOT&E, consisting of a ground phase at Fort Sill, Oklahoma, and a two-missile live firing phase at White Sands Missile Range, New Mexico, was conducted in August and September 1996. Live Fire testing, consisting of an arena test (22 M74 bomblet firings) and two end-to-end missile firings (one DT shot against a 9-target array and one OT shot against a 15-target array), was completed in September 1996. During 2QFY97, DOT&E completed its assessment of the Army TACMS Block IA and participated in the Integrated Product Team preparations for a March 1997 Army Systems Acquisition Review Council Milestone III decision. Problems identified in the Army's and DOT&E's assessments caused the Army Acquisition Executive (AAE) to delay the Milestone III decision until 2QFY98, and grant approval for a second LRIP contract award for 97 missiles. The Army Training and Doctrine Command (TRADOC) was coordinating a sensor-to-shooter assessment to determine the Army's capabilities to detect targets at the Block IA ranges and to process that information in a timely manner. They have established a General Officer Steering Committee to monitor progress of the assessment. The GOSC includes the Deputy Under Secretary of the Army for Operations Research; the Assistant Deputy Chief of Staff for Operations-Force Development; The Deputy for Systems Management; the Program Executive Officer (PEO) Tactical Missiles; PEO, Intelligence and Electronic Warfare; Commandant, U.S. Army Field Artillery School; Commandant, U.S. Army Intelligence Center; and Commanding General, U.S. Army Operational Test and Evaluation Command. Program Manager (PM), Army TACMS, was sponsoring an excursion to a Joint Staff study of Joint Suppression of Enemy Air Defenses (JSEAD) in a Southwest Asia scenario. The excursion was intended to demonstrate the inflight survivability of the Block IA in an active threat air defense environment. If necessary, TRADOC will update the Cost and Operational Effectiveness Analysis based on the study's determination of missile survivability. PM, Army TACMS, sponsored additional live fire testing to improve characterization of M74 bomblet effects against the threat targets. Those tests include employment of a live warhead against trucks and fuel containers, and arena testing to characterize bomblet pyrophoric effects against targets configured with fuel and ammunition. After analysis of the IOT&E, LFT&E and flight test data which were generated in accordance with the approved TEMP, DOT&E assessed the Army TACMS Block IA to be not operationally effective, and not operationally suitable as tested. The DOT&E assessment was based on deficiencies in the target acquisition system at Block IA ranges, missile performance, bomblet lethality, missile inflight survivability and reliability. The Army's conclusion was that ATACMS Block IA was suitable and marginally effective. The AAE's Acquisition Decision Memorandum (ADM) stated that a favorable decision at the Milestone III will be contingent on addressing the following issues. Using Joint Command, Control, Communications, Computers, Intelligence, Surveillance and Reconnaissance (C4ISR) architecture, can the Army consistently demonstrate the ability to detect and locate targets with the required accuracy at the extended range of the Block IA system, and then provide the targeting data to the Deep Operations Coordination Cell in a timely manner? Can the Army demonstrate the ability to achieve the required level of effects on all of the Block IA Operational Requirements Document (ORD) targets? Can the Army demonstrate, through modeling, inflight survivability when attacking the ORD targets in a realistic operational scenario? Can the overall missile reliability (inflight and prelaunch), and launcher reliability requirements of the Army TACMS Block IA system be achieved during the life of the system? The cause of the low prelaunch reliability was identified to be a problem in the launcher Global Positioning System software which affected the transfer of a precision timing signal to the missile. The Army corrected the problem and tested the corrected software in January demonstrating that the software performed as intended. On 25 June and 03 December 1997 they further demonstrated the fix with successful test flights.